I once met a foreign girl in Amdo who hadn't eaten tsampa before. While the mother of the household was preparing her a bowl I could feel the anticipation rising. Soon I would again see a miniature carneval that would end in half of the tsampa being on the floor, with the rest stuck to her fingers like somekind of glue. The Tibetans, clearly more sensitive to her nutritional needs than me and the dog, offered to roll it up for her; to my delight she declined the offer. Several twists and turns later the whole spectacle came to an end. Nearly clean fingers, nothing for the dog. "How did you do that? ", I asked. "I used to do pottery", came the answer. Making tsampa is in many ways like working with clay. On the one hand it is a matter of getting the right proportion of ingredients, of balancing the fine line between mud tsampa and sand storm tsampa. On the other hand, it takes a skilled hand to shape it into an edible piece of art without spilling it left and right. There are basically two ways of serving up tsampa. The more common way is to put the barley flour in first and then pour tea on top. This way it is possible to drink several cups of tea and then proceed to the task at hand when the time is ripe. The downside here is that you need to determine how much of the tea to leave in order to get the proper consistency. Most beginners tend to drink too little (or none at all believing it is all ready to go), which invariably results in mud tsampa. Contrary to what it may seem like, you will need to drink nearly all of the tea. Although the bottom layer of the bowl will still be dry, the tea is to some degree soaked into the upper layer and this is almost enough to make perfect tsampa. So just leave a very thin layer of tea. If in doubt err towards mud rather than dust, unless you prefer choking on overly dry tsampa to washing your hands afterwards. The flour can also be poured in after the tea, in which case the ratio of tea to flour is pre-determined by your host. The challenge now is to not disturb the harmony by spilling, which is easier said than done since the flour as a rule rises high above the edges. If you make flour heaps on the floor you will be punished by mud in the bowl, unless your host helps you save face by offering you more tsampa. It is not uncommon for native Tibetans to have to adjust the tsampa-tea ratio for optimum texture down the road, but the reason is not usually a sandstorm but rather personal preference or a slight miscalulation. Even though you don't need to worry about proportions, this is still the harder way to eat your tsampa with style. Butter is the great equalizer in the tsampa equation. Its greasy nature helps bind the flour together, which means that even though you might end up with too little tea you can still be saved by a big chunk of butter. Butter also helps add some needed weight if you have too much tea. One cannot but conclude that the more butter the better. It is unfortunate that many, if not most, non-Tibetans find the somewhat rancid taste of yak butter unpalatable. You have been warned: omit the butter and you will not only be perceived of as strange, but you will also have a very small margin of error. If you are hiking you will also omit some much needed calories from your meal. My own experience is that the taste of butter grows on you. It took perhaps a month of daily eating to go from being a butter-hater to a butter-lover; after another 12 months I nearly loved butter as much as I do little furry baby yaks. It helps if there is not much else around to eat. While the challenges posed by floating and submarine tsampa differ, the technique is essentially the same: Use one finger at first to avoid messing up your whole hand in the initial wet phase. When your finger starts to encounter more resistance due to the mixture thickening up, it is time to plunge in there with your whole hand. Pull in the mixture with the fingers and squeeze it hard against your palm and the bowl to make it firmer and more dense. This is not a back-and-forth movement, as the goal is to get everything to mix with everything. Rotate the bowl with the hand holding it to keep working on all areas of the tsampa. 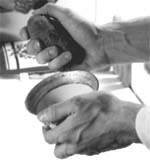 Use the index finger side of the hand to push back in any tsampa that starts to go up over the edge when turning the bowl. Don't worry about your hand feeling slightly sticky in the beginning; unless you really have too much liquid it will start to dry up with the tsampa itself. If everything works out, your hand will actually not have any trace of tsampa left on it after you're done. When the consistency is more or less even you can either start nibbling small pieces of it, or you can go for the grande finale and roll it up into a single piece. When it is dry enough you don't need the bowl anymore, just take it out and massage it in your hand. The good thing about this method, is that now your bowl is free for tea. Tea is never wrong with tsampa. Trust me.